For almost all of those 20 years, as seen above the front speakers in our HT were 3 Velodyne DF-661s (~$1000 each in 1994), a speaker designed by Velodyne to have the lowest possible distortion, but unfortunately at the expense of tonal balance, efficiency and dispersion. I tinkered with these speakers for years modifying the crossover to improve the tonal balance/ frequency response at the cost of even lower efficiency - no doubt why I liked the Dreadnaught power amp! Other speakers in our original HT included 2 Velodyne 15” Subs and 2 then 4 Definitive Technology surround speakers. I have swapped out my Anthem preamp/processor for an Integra DHC-80.3 processor that supports the newer surround sound formats and more recently purchased a D-Sonics Class D 7 channel amp (800w x 3, 400w x 4) that while it has all the potential power of the Dreadnaught and more, runs nice and cool and an uses (wastes) a lot less energy, which is very important to us as we are trying to achieve net zero energy with our new home and solar panels. As I was finishing up the new HT, it became obvious that is was time to look carefully at replacing speakers, both in terms of performance and appearance. The DF-661 without their grill covers looked nice and high tech, but after 20 years, I wanted something a bit nicer looking. At the same time, I didn’t want to sacrifice sound quality as frankly as modified and when properly setup and calibrated using Audyssey the DF-661 sounded pretty darned good with a Velodyne 15” DD sub covering the low end. As you can see from a review below I wrote on amazon.com I am a strong believer in having 3 more or less identical front channel speakers and I was very pleased to find the Polk LSiM series of speakers which I have chosen for all of the home theater speakers in our new home. 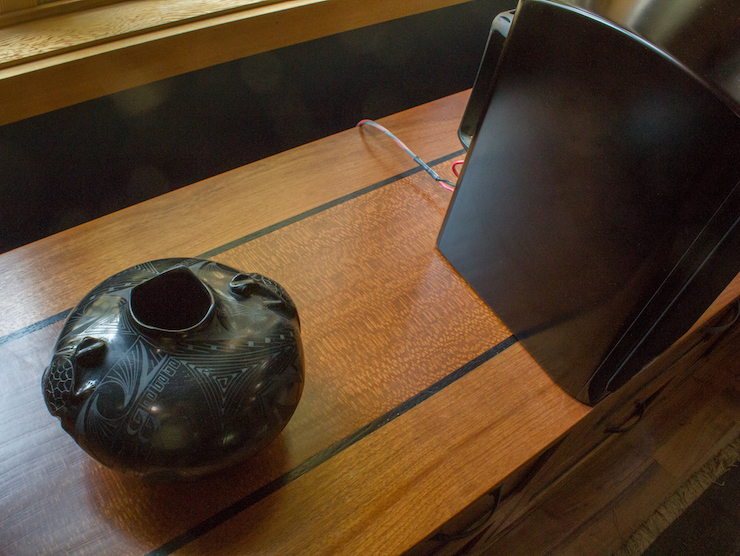 We are also using Polk speakers in other rooms/zones of our new home. The custom cabitnet above was designed to hold the various audio video equipment associated with our theater. Here khaya is combined with the darker wenge and lacewood for the inner field in the top and doors. You can see how the LSiM 705s and the 703 speakers work across the front. I have four LSiM 702F/X as well as the projector at the back of the room. More pics to follow. With stereo sound reproduction, nirvana was having one or two chairs placed at the sweet spot exactly on the centerline between the two (front) speakers. In the sweet spot the sound was great and with decent speakers one could imagine the various musical instruments and singer, etc., in their positions between the two speakers. Move off of that center line and the sound would invariably shift to the nearest speaker because of the phenomena knows as precedence where we tend to perceive the sound as coming from the nearest speaker. 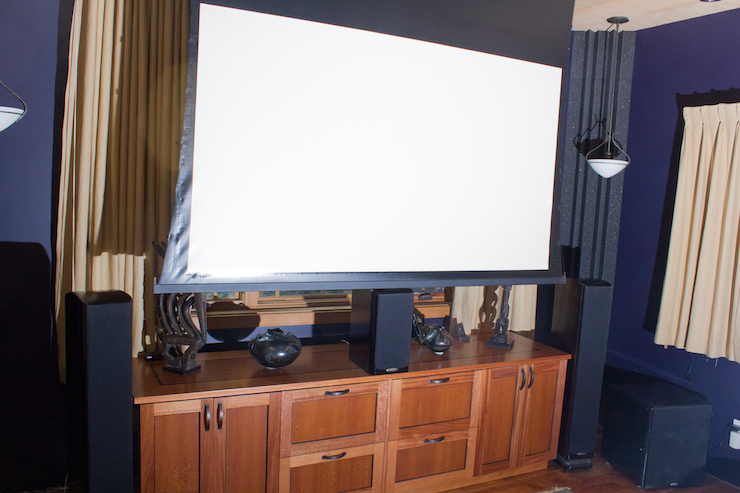 For Home Theater (“HT”) reproduction, it is critical that dialog be firmly anchored to the screen, even for viewers seated well off the center line - thus the need for an additional center speaker where much of that dialog is reproduced with effects and music distributed between not only the 3 front speakers, but the rear speakers as well. For both the reproduction of multichannel music and movies/TV it is critical that the timbre and horizontal dispersion characteristic of the three front speakers be as identical as possible. This can really only be achieved with 3 identical speakers, or at least 3 speakers using the same drivers in the same orientation. This is where the "Center Speaker Dilemma" arrises as sonic nirvana and ascetics clash for many setups. Multiple drivers are used in modern speaker systems to achieve the desired frequency response and dispersion characters. It is well understood, that with vertically orientated drivers, the combing that occurs when multiple drivers reproduce the same frequency leads to lobing or uneven dispersion of sound in the vertical direction. This can be a good thing for controlling sound reflections off the floor or ceiling. 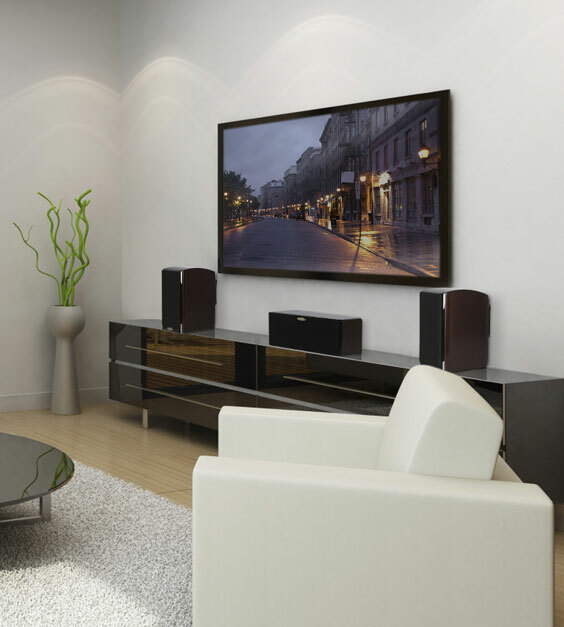 On the other hand, with vertically orientated drivers sound dispersion in the horizontal direction is quite uniform which is exactly what one wants for the center as well as the left and right speakers in a home theater. With the horizontally orientated multiple drivers found in all “center channel speakers”, this lobing or uneven frequency response happens in the horizontal direction - exactly the opposite of what one wants if everyone in the room is to hear the same sonic presentation. This is well understood and the original specification for THX certified HT systems insisted on 3 identical vertically orientated speakers up front. Period. 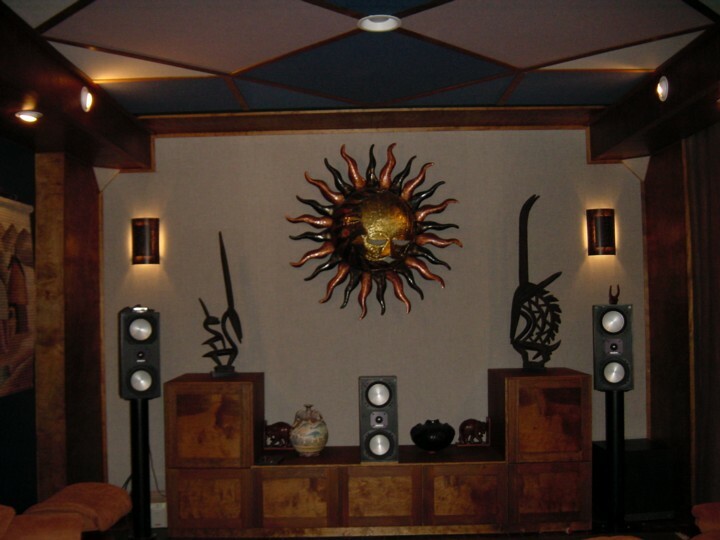 Unfortunately this did not alway meet the furniture or ascetics needs of those choosing HT speakers - hence the invention of the “center channel” speaker with horizontally orientated drivers that would sitjust above of below the “TV”. (The best of these horizontal designs do have the tweeter and midrange in a vertical orientation and then typically multiple woofers on both sides). There is no acoustics or sonic reason for the horizontal arrangement of drivers in center channel speakers. If is simply wrong, or a compromise at best. See http://forum.blu-ray.com/showthread.php?t=89614 (Sound bars are a whole different thing). Perhaps for some people this horizontal center channel speaker compromise is the right one, but unfortunately we have come to the point where these center channel speakers are so common that they are used even when a more proper speaker, such as the LSiM 703 would be a better choice. Take the picture above these reviews. 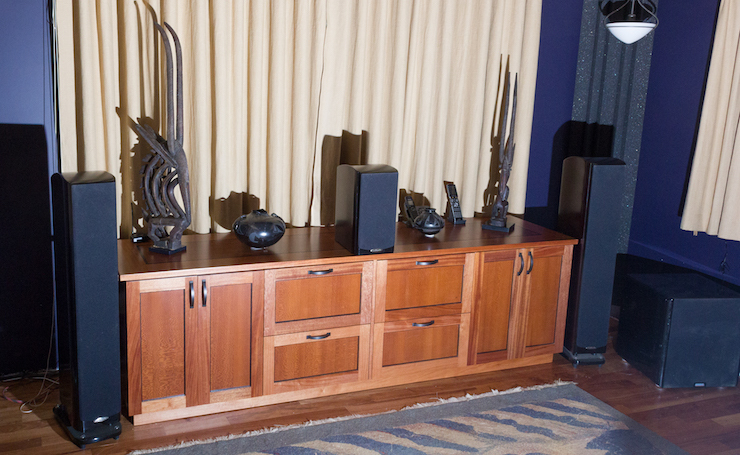 A pair of LSiM 703s are used for left and right speakers and a third 703 would clearly also work as the central channel speaker with this setup and achieve the sonic perfection associated with identical speakers in an identical orientation. In this case there is no reason for a horizontal center channel speaker and yet there it is on the 703 page, as if it were the better answer than a 3rd 703. Or, as I have done, use a 703 as the center with LSiM 705s (or 707) for left and right as both of these towers have the same drivers as the 703 in the same orientation. Let me just say that the combination is magic with the three LSiM vertically orientated speakers working together seamlessly to create a wonderfully defined soundstage with multichannel music discs such as Emmylou Harris’s Producers cut, or stereo sources processed with Dolby Pro Logic IIx. In our HT, both my and my wife’s chair are off center as there is a small table, for food, beer, etc, on the center line. Stereo reproduction works OK in these chairs, but voices are definitely shifted to the nearest speaker by the precedence effect. The same stereo source processed with Pro Logic IIx Music mode allows the three LSiM speakers work together flawlessly to create a much better more accurate soundstage for everyone in the room. And of course, the soundtrack from TV and movies are wonderfully recreated as well. You can read more about my system and experience here, but in my book the LSiM speakers are an amazing value as they look and sound fantastic. What makes the 703s fairly unique is that they are a fairly compact 3-way system with very high quality vertically orientated drivers and yet are not so tall as to preclude use under or above the screen in many HT setups. I my case I have a projector at the back of the room and a screen that rolls down from the ceiling at the front of the room, and stops just above the 703 siting on the equipment cabinet. Whether you use three LSiM 703s up front or mix a 703 center with the 705s or 707s on the sides is a tough choice, but only because they are all good choices. In either case you will also want a subwoofer and surrounds for a serious HT setup. I have a 15” Velodyne DD sub as well as 4 LSiM 702F/X for surround speakers. I drive the 7 Polk speakers with a D-Sonics Class D 7 channel amp (800w x 3, 400w x 4), so I am not too worried about the LSiMs being somewhat less efficient than some other speakers. If you have no choice, then the 704c or 706c will work for the center channel, but don’t be fooled it to thinking that these horizontal center speakers are the ideal center channel speakers or that center channel speakers need to be horizontal. They don’t and the best ones, such as the 703s, are not!